The Bureau of Economic Analysis announced today that U.S. real GDP grew at a 2.3% annual rate in the first quarter. That’s a modest slowdown from the 3.1% average we saw over the previous 3 quarters. 3.1% is also the average growth rate for the U.S. economy over the last 70 years. But the Q1 reading is pretty much on par with the 2.2% average growth since the Great Recession ended in 2009. 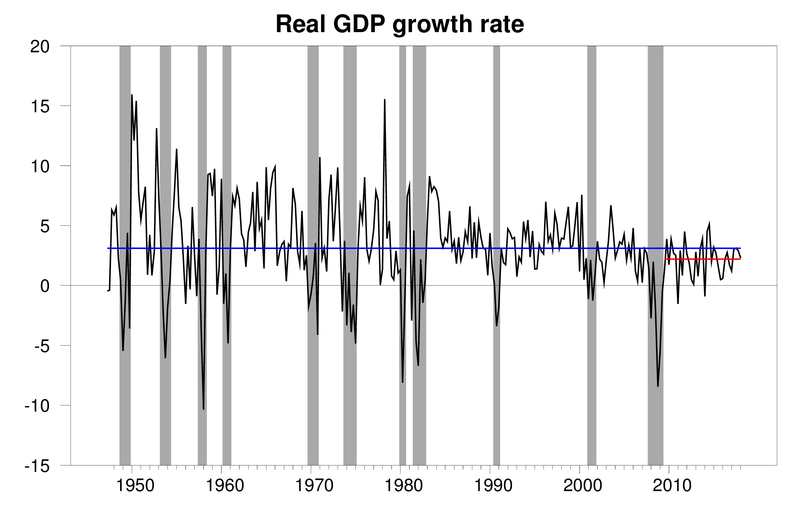 Real GDP growth at an annual rate, 1947:Q2-2018:Q1, with the 1947-2018 historical average (3.1%) in blue and post-Great-Recession average (2.2%) in red. Slightly softer first-quarter growth is something that’s become pretty typical in the recent data. Since 2010, first-quarter real GDP growth averaged 1.3% at an annual rate, compared with 2.5% for the other three quarters. We get a smoother impression looking at year-over-year growth, which for 2018:Q1 came to 2.8%. 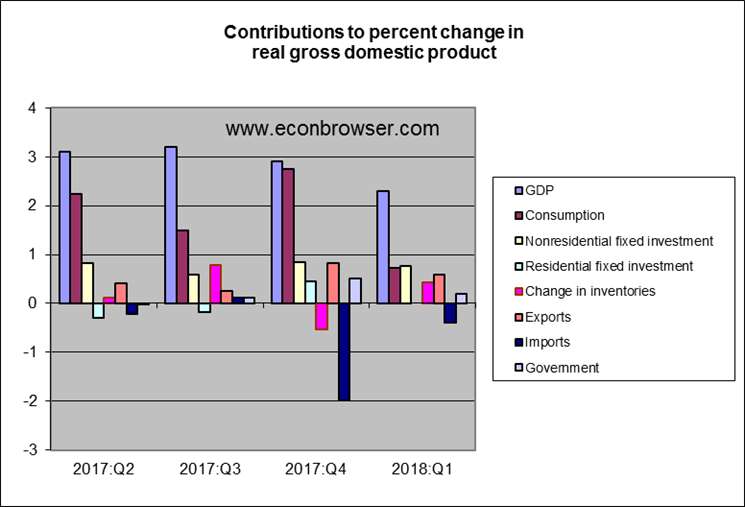 Top panel: quarter-to-quarter real GDP growth, quoted at an annual rate, 2009:Q4 to 2018:Q1. 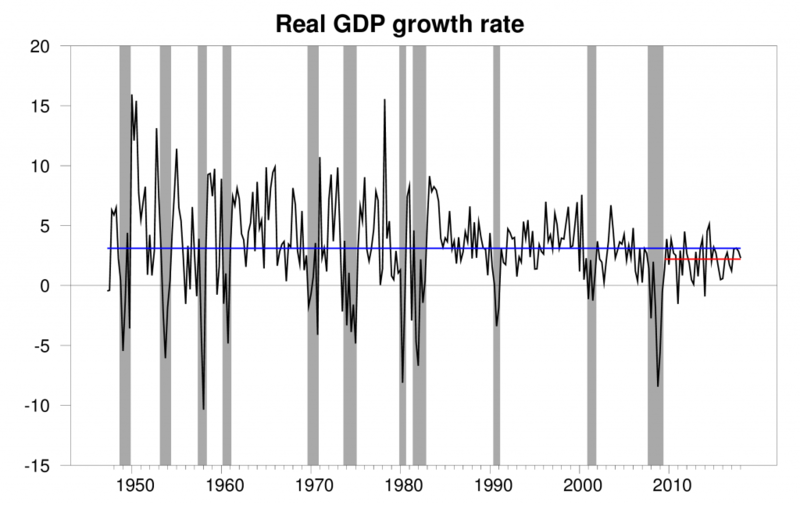 Bottom panel: year-over-year real GDP growth. 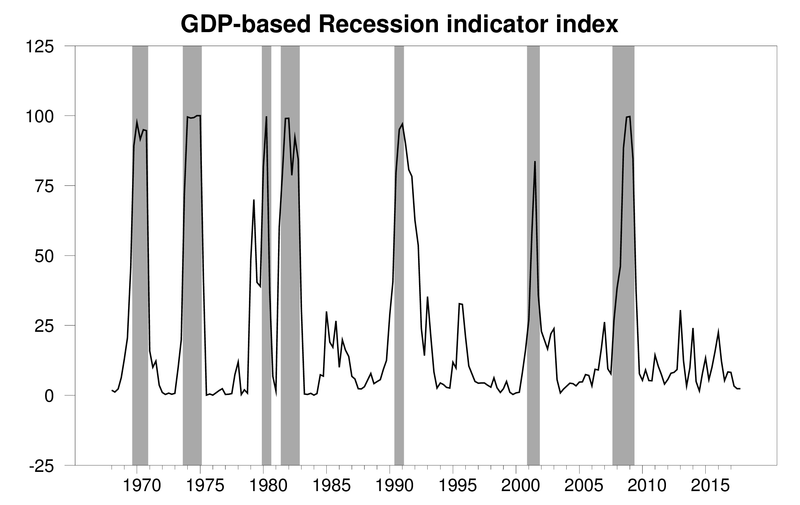 With the new data, our Econbrowser Recession Indicator Index held at 2.4%, exactly the same as the previous reading. The U.S. remains clearly in the expansion phase of the business cycle. 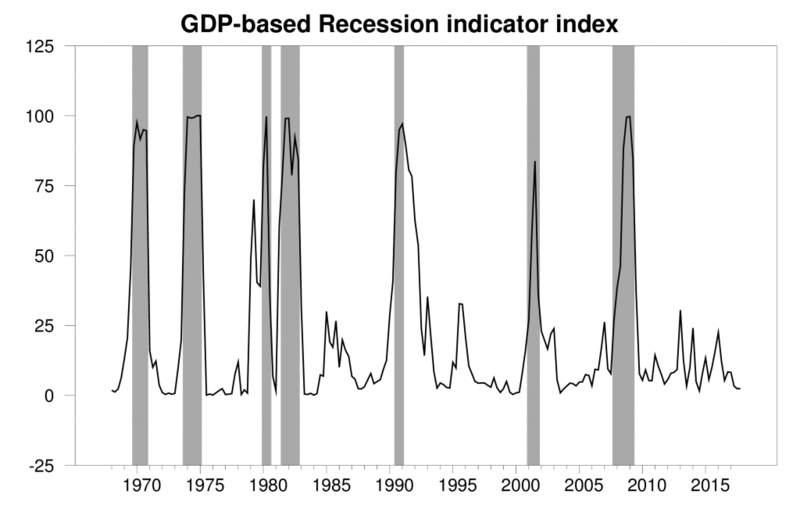 GDP-based recession indicator index. The plotted value for each date is based solely on information as it would have been publicly available and reported as of one quarter after the indicated date, with 2017:Q4 the last date shown on the graph. Shaded regions represent the NBER’s dates for recessions, which dates were not used in any way in constructing the index, and which were sometimes not reported until two years after the date. Higher exports and nonresidential fixed investment made solid contributions to the first-quarter growth. The main slowdown came from much slower growth in consumption spending than we’d seen in 2007:Q4. The growth in consumption between 2017:Q4 and 2018:Q1 was unimpressive in part because the Q4 level was so strong. Again, when you look at year-over-year changes, the latest data don’t look particularly alarming. The always perspicacious Bill McBride notes that nominal nonresidential fixed investment actually grew pretty sharply in Q1 (up 8.2% at a logarithmic annual rate). But this added spending contributed nothing to real GDP growth because all of the surge was attributed to higher cost of housing. And the implicit price deflator on personal consumption spending was up at a 2.7% annual rate in Q1 for the second quarter in a row. Bottom line: the report shows the U.S. economy is still growing solidly with some signs that inflation is starting to pick up. This entry was posted on April 27, 2018 by James_Hamilton. Great to see you posting. It has been quite awhile and some worry has set in. Was it your NCAA prediction in the top ten for the Econbrowser group? Don’t fight the Fed but fight for every else. Ed Hanson: I’m fine, but have had a pretty crazy schedule the last 4 months. Hopefully I’ll be doing some more blogging in the coming weeks. On the NCAA tournament, I did pick Villanova to win but got most of the rest wrong. Home Depot certainly is doing well with $100 billion in sales last year and a 14% operating margin. Nonresidential investment and exports showed solid growth but government purchases barely grew in real terms. I thought I recalled seeing something about a problem with seasonal adjustments. Could that be the issue here? don: Yes, that’s what we’re talking about. I think I’ve made it clear here before, although I read tons of research papers (“tons” compared to the average Joe), and general news like NYT, I consider myself a “wanna-be”/amateur economist. But my understanding was the first quarter numbers tend to be high because it takes time for the Christmas sales to be tabulated into the numbers. Similar to how the Value Added numbers are only up to 2014 in the year 2018. That may sound kind of contradictory in the sentence, but basically I am talking a certain % of December sales showing up in profits in January-etc. Maybe I misunderstood, always happy to be educated. We used to use the X-11 program to adjust parts sales at Ford when I was there. It worked pretty well for ordinary parts and assemblies, but couldn’t handle the high volume, marketed items (filters, etc.) because the “normal” winter and summer promotions were gradually changed to a more variable timing. So, if the 20-year history the program used expected an uptick in sales each January and the current sales had both a January and April promotions (we did that to improve inventory and logistical aspects), the calculations for SAARs got totally screwed up. As consumers go to more on-line shopping with less advantage for specific timing of purchases because there are “sales” every month, one might expect that the SAAR adjustments will take time to reflect that. Sure, there will still be seasonality, but probably smaller peaks and valleys. Another factor that affects larger purchases, such as vehicles and homes, is the weather. If anyone else noticed, the weather this winter was pretty crappy in the northern tier states and that might have put a damper on some purchases. Great post. By Mr James Hamilton. I don’t know, Professor Hamilton’s throwback “clothes line” move on Brad Delong with the δ symbol for depreciation was pretty vicious. but those old school guys like Hamilton take no prisoners. Although when Hamilton jumped off of the ropes to slam Delong while hiding a sharpened δ symbol in his wrestling trunks, he almost took it too far though. Is 2.3% the annualised or annual rate. There is a difference. ONLY Yanks pay attention to the annualised rate. Everyone else looks at the SAAR! The ‘advanced’ has forecasts by the department in it. Another reason top ignore it and wait for the next estimate which again most other counties do as their first estimate. Has anyone ever examined the revisions between the ‘advanced estimate and the next estimate at all ? Why does the USA have an ‘advanced’ estimate? It is the annualized rate for the first quarter of 2018.
okay I see now the SAAR is actually better than the annualised rate. sorry about that chief. ( what you never watched Get Smart). 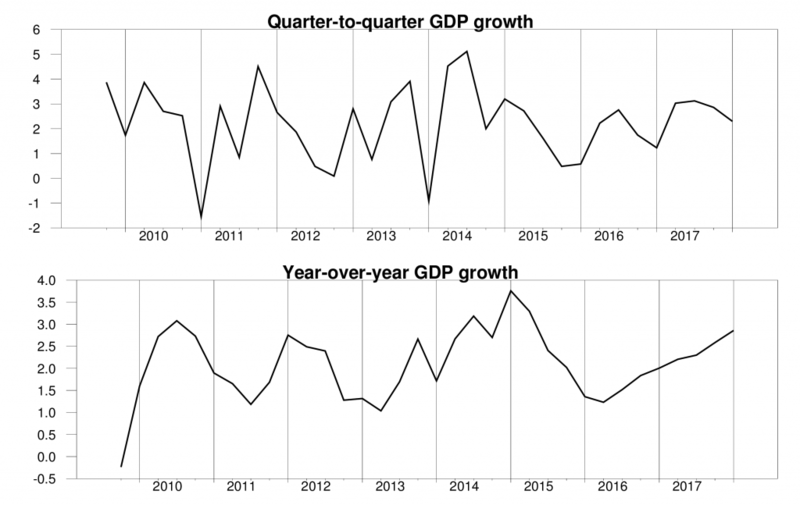 The U.S. economy is on the right track to raise GDP growth, after the failed restructuring in the Obama years, when it should’ve focused on cyclical growth to close the output gap. The economy needs tax cuts, deregulation, a reinvention of entitlements, smaller government, and greater competitiveness in international trade. Work can be promoted and with that, an increase in the minimum wage to further promote work. Peak Trader is obviously not old enough to be on Social Security or even have a clue about how it works. Here’s a quick primer for him and others who don’t seem to understand the program. First, Social Security is in a sense means tested with 85% of one’s earnings subject to Federal income tax when one’s income exceeds a fairly small threshold of $44K. Secondly, in retirement one has to pay the monthly Medicare Part B premium (also means tested with five categories of increasing premiums ranging from $134 to $438/month) and the Part D drug benefit premium as well. Both Part B and D have yearly deductibles and co-payments (which can be covered if one is smart enough to purchase medigap insurance). Also, one most likely has to have withholding taxes taken out of the Social Security check so that one doesn’t face an unpleasant tax bill at the end of the year. I know all this because both my wife and I have been on Medicare for the past five years and are now taking Social Security. He knows how this works. But Peaky is a lot like Paul Ryan. He does not care about most of us as long as he gets tax cuts for rich people. PT: “so consumers can shop around to reduce costs..” Brilliant, as usual. And who needs an OR anyway? I figure any hospital room will do with my kids doing pre and post clean up. If the hospital doesn’t approve? Nothing wrong with a home operation. Women have birthed at home for centuries, and docs performed lots of surgeries in homes when America was really great. Thanks for the advice. Guys like you can change the medical field forever, if only you’re given the chance. BTW, you’re also advocating MANDATORY employer provided health insurance? For all employers? Noneconomist, many Americans go to foreign countries for cheaper knee replacement, because it’s expensive here. Sure, I like luxury goods like overregulated healthcare, maybe we can get Cadillac SUVs from the government too. You can’t get employer healthcare coverage without employment. Shopping around for the best medical deals means being able to afford foreign travel? Again, brilliant. Adequate “free market” medical care would suggest sufficient supply (of providers, et. al.) in order to meet demand for care. Lacking that, there is little use in shopping around for “the best deal.” Unless, of course, you can afford a trip to…India? Oh, and way to avoid explaining your call for MANDATED employer-paid—by alll employers?—health care. I truly do not understand this animosity toward free market pricing. I also do not understand any freedom denying mandates of forced medical insurance coverage. But the first part, free market is out there even though the government tries its best to not allow it. Peak is right about the availability of excellent and lower cost medical care outside the county. It is reasonably easy to find if that is what a person wants. But perhaps, you prefer the familiarity of the US, then just go here, online and then in person. Cost depends on procedure but just click step #2 and search under ‘knee’ and get a good idea of the major cost. For example, the most expensive procedure – Total Knee Arthroplasty (Knee Replacement) $15,499*. Check around the website, a number of alternatives are available. Another excellent post poisoned by your usual right wing babbling. We have asked to stop but you won’t. But at least you finally provided a link! To Cato, however? Typical. Edwards wrote this in 2009 when Obama was pushing fiscal stimulus precisely because we had a large output gap. This bit about “failed restructuring” is just babble by Peaky. But isn’t amazing that Peaky’s Cato guru writes as if we were at full employment when we clearly we were not. Even more amazing is that Peaky is oblivious to the difference in the view of his guru and his latest incoherent rant. Pgl, so, the low growth and huge debt from Obamacare, Dodd-Frank, more and excessive other regulations, in many industries, wasteful and excessive government spending, more payments for less, little, or no work, steeper progressive taxes, “spreading the wealth,” anti-business sentiment, etc. isn’t a restructuring of the economy to you? The liberal progressive economic policies you support have been progressing into more failure and another financial crisis. Even the Fed couldn’t bail you out. You need to look at libertarian and conservative progressive policies to achieve prosperity. Destroying potential output is a ridiculous way to close the output gap. Opium will destroy the U.S. as much as China. “As more and more addicts were created, Emperor Dao guang (1821-1850) of the Qing Dynasty became alarmed. He ordered that Guangdong (Canton), the only port then open to foreigners, be closed to all opium traffic. But British captains evaded the edict by smuggling opium into China with the help of local pirates. Opium presently became so widespread that by 1838, officials in Guangdong and Fujian were notifying the Imperial government that nine people out of ten in these provinces were addicts. The Emperor responded by naming as High Commissioner to Canton, a most extraordinary man, Lin Zexu. Lin was given strict orders to rid the country of opium. After confiscating and destroying the opium stocks and pipes being sold by Chinese merchants, Lin put pressure on all merchant ships in the harbour carrying the drug to deliver their opium stores to him. Although these stores were publicly disposed of, it did not restrain the British as he had hoped. One tension led to another, finally erupting in the war of 1839 to 1842, called the Opium War by the Chinese. It was an epithet bitterly resented by the British, who piously maintained that the war’s purpose was to teach the Chinese a lesson in free trade. Just what kind of trade was meant was obvious from the swarm of opium boats which followed the Royal Navy upstream to Nanjing, where the Qing Dynasty was forced to sign a treaty opening China to trade. As you probably know, I have been spending some considerable time on illegal immigration recently, largely due to the unexpectedly positive reader response to two CNBC articles I wrote last year. As part of my work, I have looked at the pathology associated with black markets, specifically related to migrant labor and incidentally, to drug trafficking. I can tell you that the predation associated with black markets arising from US immigration and drug policy came in about two orders of magnitude worse than I expected. About 60% of Mexico’s horrendous murder rate can be attributed to US ‘prohibitions’, as can 640,000 adverse events to migrants this year (I have revised the numbers at the link upwards: https://www.princetonpolicy.com/migrant-perspective/); and comfortably half the US inner city violent crime rate. Prohibitions are literally the leading cause of violent crime in the US and Mexico. As for opium, we have a fentanyl, not heroin, crisis. Fentanyl is 50x stronger than heroin, and cheap to make. It is contaminating not only the US heroin supply, but increasingly the cocaine and meth supply as well. As a result, users are regularly receiving doses multiple times as strong as they are anticipating. Just 8% fentanyl in heroin will make it 5x as strong. This is leading to 60,000 overdoes deaths a year (call it 40,000 excess overdose deaths). There is no way to keep fentanyl out of the US. Border Patrol seized just 181 lbs of fentanyl last year (away from official check points). That’s about five backpacks full, whereas I estimate we will see 80,000 drug smuggling drips away from official crossing points this year. There is simply no way to keep it out: it is too potent, too compact, too easy to make. Now if we legalize hard drugs, we can probably reduce the death rate by 90% or more, at the cost of somewhat higher addiction rates. Steven Kopits, your estimates make no sense. When you legalize something, you get more of it and increase social costs substantially. You may not get drunk on a glass of wine, but you can get very high very quickly with marijuana and other illegal drugs. Mexican cartels make money in other rackets besides drugs, including extortion and kidnapping, and they would sell drugs on the open market if legalize. I have no reason to disagree with your illegal immigration estimates. However, it seems, if foreigners knew we had strong laws against illegal immigration, there would be much less illegal immigration. Extortion and kidnapping are heavily linked to Central American migrants. So, Peak, are you for re-Prohibition? Let’s talk about Prohibition. It reduces alcohol consumption by all of 16% for a 2/3 rise in the national murder rate. That’s why it was repealed! You think that mobile phones don’t work in Mexico or Guatemala? If there is a job opening in the US, that will be known in Latin America within hours. They are well aware of US laws — that’s why they are coming illegally over the border! They probably do not appreciate the full range of risks. To the best of my knowledge, I am the first to catalog the list of predation afflicting migrants. But women are well aware they can and will be raped; men are well aware that they may have to carry drugs; men are well aware they are likely to be robbed. I don’t think they have a good idea about being kidnapped or being killed. I suspect they greatly under-estimate the probability of death, but it’s very hard to get a clean estimate on mortality. I am happy to provide backup calculations for any number you would like. Right now, you are signing up for an additional 500k opioid deaths. That’s the reality. “What everyone ”knows” about Prohibition is that it was a failure. But the conventional view of Prohibition is not supported by the facts. Also, if foreigners knew we had strict immigration laws, many fewer would make the attempt to enter the U.S. illegally. I agree, there may be 500,000 deaths before the opioid epidemic ends. PT: Last I saw, yearly tobacco-related deaths still far exceed those caused by opioids. As do deaths related to alcohol. Very likely, heavy opioid users are also tobacco users AND drinkers as well. As far as the war of drugs: we’ve finally reached a point where-at least once a year for the past 20–the big evening news story has not announced “Biggest Drug Bust” ever. (Legalization of marijuana in many locales may have something to do with this) Fairly obvious to me that yearly biggest drug busts meant the war was being lost despite huge sums of money being spent on interdiction, court times, and incarcerations. Oh, and daily airplane and helicopter flights (with a couple of deputies on board) looking for illegal grows. That’s your idea of success? If you believe we can jail our way out of any addiction crisis, I have decently priced ocean front property in downtown Bakersfield just waiting for the right chump to purchase it. BTW, great advice from chain smoker Bill Bennett, who likely offered that wisdom while being an admitted Vegas gambling whale. If you legalize hard drugs, then you can get better control over supply. Again, the problem is that hard drug users aren’t consuming what they think they are. If you can create a channel for them to consume drugs legally, then you can also control the drugs they consume. So, sure, I am quite confident that excess heroin deaths can be reduced by 90%. I don’t think we get there, but it’s not that we couldn’t. I can tell you for a certainty that enforcement will be an abject failure. Fentanyl is just too compact and potent. So we are left with that half million deaths. As for pot, I expect marijuana usage to increase quite substantially, 2-3x, over the next 20-30 years, with significant displacement of alcohol in the process. So far, marijuana legalization, from a public health standpoint, does not appear to be too bad. However, as usage rates go up, perhaps that changes. From my perspective working on market-based visas, I would note that drug smuggling across the Mexican border is down 84% since 2009–all of the decrease coming from marijuana. So we are winning that particular war, but all due to marijuana legalization. This serves as a kind of model — legalize and tax — for illegal immigration and market-based visas. With market-based visas, we could achieve effectively end illegal immigration in the next few years. No need for a Wall. No aggressive enforcement. Just a straight-forward commercial system that allows migrants to pay the market rate to work in the US at market clearing levels. Conceptually, it’s a piece of cake. Steven Kopits, you make several false assumptions. The Mexican cartels are criminal organizations – it’s not just drugs. They’ll offset revenue losses, including by selling marijuana legally in the open market. Legalizing drugs will increase demand. Alcohol with marijuana or other drugs is a powerful combination – alcohol won’t be replaced. Marijuana grows like a weed. People will cultivate their own, more powerful, marijuana. Our immigration policies for illegals and sanctuary cities are why so many people risk their lives to enter the U.S..
Drug legalization will create more addicts and therefore more overdoses. “Getting high looks like a lot of fun in Horsedreams. Until it doesn’t. And then it looks really, really ugly. The drug use starts off casually enough. The important part is the fun they have getting blasted together…and soon enough (or perhaps, too soon) Desiree and Loman are married and raising a baby in Westchester. But Desiree, who couldn’t make it through her wedding or her pregnancy entirely sober, can’t quite leave the good times behind as a suburban mom. She starts sneaking a line of coke on the weekends, then more during the week, before she graduates to speedballs—mixing her coke with heroin. By the time her son Luka is three, she is a junkie shooting up horse, until she overdoses, needle in her arm on the floor of the bathroom, while her husband sleeps in the next room. Left to raise a son on his own, Loman moves back to the city and hires a nanny to watch Luka. Mira, a 40-something black woman living in the projects in Harlem, first sees Loman as a rich white guy—an Upper East Side lawyer taking limos around town while someone else raises his kid. But she quickly realizes what they have in common: Addiction has ruined both their lives. He’s been left widowed and lonely; she’s lost her father and brother to drugs, and has to work at a job that makes poor use of her obvious intellect to support herself and her alcoholic mother. Mira knows the horrors of addiction. The two pillars of Mexican crime are drug and human smuggling–both black markets that exist due to US drug and immigration policy. There are ancillary businesses, for example, robbery, kidnapping and extortion, human trafficking and a few others. Many of these are related to drug and human smuggling. For example, kidnapping and extorting migrants is a big business. Clearly, if migrants could cross Mexico legally, the opportunities for robbery, kidnapping and extortion would be much less. Rapes might fall by as much as 99% for migrants during a crossing. Interestingly, the data suggest that losses from the legalization of an activity are not offset by new activities. For example, the loss of massive volumes of smuggled marijuana has not been offset by any major increase in smuggling of other drugs away from official crossing points. We would anticipate that legalization will increase demand, but by how much? Is that worth all the bad side effects of prohibition? Also, there is some — but not conclusive — evidence that increased marijuana sales leads to lower beer sales. Legalization of marijuana is linked to lower opioid use. Well, you could always do that. I think we see an emerging business. We don’t make our own wine, mostly people will buy pot. Migrants principally come to arbitrage the wage differential, $2.50 / hour in Mexico v $10 / hour in the US. Weird comment. It was the lack of sensible financial regulations that led to the financial crisis and the Great Recession which is why we needed Dodd-Frank. You need a better source of right wing talking points than Fox and Friends. As far as the rest of your incoherent babbling – it was just that. Incoherent babbling. Dodd, Frank, and others in Congress promoted excess lending in the housing market for over 10 years before the financial crisis, and then restricted lending after the financial crisis. They went from one extreme to the other. Dodd-Frank contributed to slow growth after the financial crisis. And, I don’t disagree with some liberal policies, and don’t agree with all libertarian and conservative policies. Only rigid ideologues support only liberal policies. The “War on Drugs” saved the U.S. trillions of dollars in social costs. Spending $20 billion a year to prevent and reduce $300 billion a year in social costs, which include lost productivity, traffic & work injuries & fatalities, health problems & drug treatment, mental illness, unemployment, crime, domestic violence, child abuse, and other social services, means we’re not spending enough on the “War on Drugs,” including on rehabilitation. This alone explains his incessant ramblings! Please explain how Dodd Frank promoted excess lending for years before it was enacted. I’ve explained it many times before. Dodd and Frank, along with others, promoted “affordable loans, particularly for minorities, although others jumped on the bandwagon, causing an excess in lending for housing. Dodd and Frank were particularly involved in that before the crisis. PT you do know Obama inherited a deficit of around 10% of GDP. Obama tried to reduce it too quickly but reduce it he did. You do know the structural deficit has increased to around 5% of GDP? Nicely said. I would venture to guess that Peaky knows all of this but bet the ranch he will never admit it. FY2008 -3.1 Start of the Great Recession. FY2009 -9.8 ~3/4 under Obama administration. All of this while fighting book end recessions. While Obama inherited Bush’s -3.1% of GDP deficit, under his policy it reached a high as -9.8% and ended his term -3.2%, higher than what he was left. If you were considering the -9.8% a Bush deficit, it was actually under Obama’s 1st year as president. Remember it was really early in his presidency when The Economic Stimulus Act of 2008 (Pub.L. 110–185, 122 Stat. 613, enacted February 13, 2008) was enacted. CoRev If you were considering the -9.8% a Bush deficit, it was actually under Obama’s 1st year as president. Remember it was really early in his presidency when The Economic Stimulus Act of 2008 (Pub.L. 110–185, 122 Stat. 613, enacted February 13, 2008) was enacted. Huh? Obama wasn’t inaugurated until almost a year later. Bush was President in Feb 2008. BTW, I supported that Bush stimulus. 2slugs, you’re correct. I got my years mixed up. TARP, the program designed to “troubled assets” to shore up fragile banks, was passed during the Bush Administration (October 8, 2008). A total of $700 billion was authorized by Congress even though only about $350 billion was ultimately spent. Of that about $250 billion was spent during the Bush II Administration (before the inauguration). When TARP funds were spent, the amount increased the reported deficit. When the funds were repaid (as they ultimately were during the Obama administration after FY 2009) they reduced the reported deficit. This accounting has the effect of overstating the deficit attributable to Bush’s policies and understating the deficit attributable to Obama’s policies. The larger $800 stimulus package passed under Obama and all of which was disbursed was never repaid. Another factor that skews the deficit picture is the effect of Fed remittances to the Treasury due to interest earned on Fed holdings of public debt (in Obama’s term, primarily due to QI). This remittances, solely attributable to monetary policy, also reduce the reported deficit. During FY 2008, the remittances were about $30 billion. During the Obama administration (both terms) the annual remittances averaged almost $90 billion. Now that QI is being wound down, these remittances are being reduced, with the effect that reported deficits are higher. As regards the deficit picture, President Obama benefitted greatly from these accounting anomalies which had nothing to do with his actual policies. Vivian Darkbloom, also, GDP growth would’ve been even lower in the Obama years without the fracking boom, and persistently much smaller trade deficits, which added to GDP. I see you learned macroeconomics from Peter Navarro. Yes – your latest reminds me very much of his now totally discredited analysis that both liberal and conservative economists have roundly mocked. Sorry dude – Obama inherited the Great Recession which caused that 9.8% you just noted. OK 9.8% is not quite 10% but you just proved his point. Good show! Not Trampis, don’t understand your point. We were on a path to a mild recession with the Bush tax cuts in early 2008, until Lehman failed in late 2008. Then, it became a severe recession. Obama’s stimulus added to budget deficits. Basically, we had an L-shaped recovery from the severe recession, which added many trillions of dollars to the national debt. Too many anti-growth policies with the pro-growth policies is like driving with one foot on the brake and the other foot on the accelerator, resulting in an expensive and slow recovery. As a result, Trump inherited a huge national debt and $500 billion a year budget deficits, along with ongoing slow growth. Housing prices would have collapsed either way. In such an event, you’re talking depression, not recession. Trump inherited an economy that some people including Dr. Chinn believes is close to full employment. Obama inherited an economy in free fall. But pardon the interruption – go back to learning economics by watching Fox & Friends! Is your bias so strong that unquestionably accept the leftist screed? And is it possible that you can not look deeper into the number to see that base number do not tell the story? Can you not see that the other story, how much to the debt through President Obama’s first term, was added before the budget deficit began to come under some control? And this may be the hardest to swallow, why the budget deficit came under some control after 2012? I will answer the last question for you. The Congress was controlled by the republicans after 2012. They took the candy of spending so much of other peoples money away from the democrats. Am I saying the republicans are better than the democrats. Yes, sort of. But they are not better enough. Today, they are falling into the same trap, overspending because the have control of Congress and the White House is in the same party. What was the deficit when he came on board not for the FY! You do what the GDP figure were when he came on board don’t you. annualised it was minus double figures. I simply do not know the SAAR figures. you were heading for depression until Bush discovered a love for fiscal stimulation and the Fed acted as well albeit too late. If you have a financial crisis you will NEVER have a strong recovery. What in the hell do banks do if they worry about bad debts. They do not lend as much. That is what occurred over there. Ed are you saying the Republican reduced spending? I have yet to see that. Obama proposed less spending over time than Reagan did. He went into budget repair far too early. Between the Banks and Obama’s fiscal conservatism you have a less tan impressive recovery. We now have republican controlling everything and the structural deficit has gone to around ( it is difficult to measure) and to be precise) around 5 % of GDP spending. so Republicans wanted to have too much fiscal consolidation when it shouldn’t have occurred and now when it is needed they do not want to know about it! Not Trampis, my apologies, I got my electiojn vs fiscal years mixed up. There have been many financial crises – some didn’t result in recession, e.g. the Panic of 1907 – and every recession has a financial crisis. There’s no excuse for such a weak recovery from a severe recession, which we never had before. Lord your lack of understanding economic history is beyond staggering. Please stop as you have written more stupid comments than anyone in the course of human kind. No about repub reduced spending, a more accurate expression would be that the repubs after years of dem designed overspending, the repubs were able to reduce the excessive spending. One little note, structural deficit is probably a good measure to help with budget plans, but a poor predictor of actual future deficits. I’m sure you have some precise definition of excessive spending. Maybe you can write a paper on it and send it to the American Economic Review. (1) Have you ever taken a macroeconomics course at an accredited college or university? Yes or no. (2) Do you believe governments should cut spending during a recession? Yes or no. (3) Do you believe deficits crowd out “other peoples’ money” when the Fed is operating at the ZLB? Yes or no. Nice multiple choice question but (1) is easy. The answer is clearly no in Ed’s case. It is not relevant whether a government should cut spending during a recession. What this severe recession showed was greatly excessive spending does not work. The economy would have responded just as well with much less deficit spending. And would have responded much better if a President Trump style tax cut had been implemented, rather than the poorly designed and mostly temporary tax changes that were made. Again the point is not a crowding out effect, the problem is a less efficient use and direction of spending. Government simply can not direct its spending efficiently and succinctly as can a hundred million decision makers. A clarifying example of what I mean, shovel ready projects.’ A President Trump style tax rate cut would have put the resources of individual citizens and/or companies, bringing the country back to vigorous grow much quicker, much like other recessions. Seriously? As hard as he tries – even Peaky cannot write a more incredibly dumb comment. Were you the chief economist for Herbert Hoover? Ed Hanson I asked three very simple yes/no questions. I didn’t get a straight answer on any of them. So I’ll have to do my best to infer how you might have answered. Question 1: It’s pretty clear that your answer should have been “no.” My guess is that a lot of your economics is self-taught, which would explain the quasi-Austrian flavor of a lot of what you write. Austrian economics has a strange appeal to people who are interested in political economy because it has an intuitive appeal. Formal macro taught in the academy is anything but intuitive. Question 2: As best I can tell you seem to believe that the government should cut spending during a recession. It is a little hard (actually, borderline incoherent) to simultaneously argue that bigger tax cuts should have been pursued. Incoherent because the spending multiplier is larger than the tax cut multiplier, as you could easily prove with a little high school algebra. So apparently you oppose policies that are more effective than the policies you support. That’s almost the definition of incoherent. Question 3: Here I think you genuinely do not understand what crowding out or crowding in actually mean. And it tells me that you don’t understand what a recession is. The simple answer is that a recessions happen when markets fail to clear. Typically this happens when there is some negative shock to aggregate demand. People just decide to buy less and save more than companies need for investment. Crowding out happens when government borrowing replaces private sector borrowing. This is what tends to happen during expansionary phases of the business cycle. Crowding out happens when low return projects from government spending absorb private saving at the expense of private sector investment. This is what the Trump tax cut will likely accomplish. But when the economy is in a ZLB recession the central problem is that there isn’t enough private sector investment, so crowding out is a non-issue. In that case the market clearing rate in the private sector is negative. But government spending absorbs excess saving and crowds in investment. If the government did not replace the lost private sector investment, then saving would have been lost…and lost forever because saving is a flow variable, not a stock variable. Nothing could be more inefficient that NOT having the government absorb excess saving because that results in a total and irrevocable loss to the economy. Even inefficient spending is better than no spending. Talk about private sector spending decisions during a ZLB recession simply assume away the central problem. It’s easy to solve problems if you assume them away, and that’s exactly what you are doing. If the private sector markets cleared, then we wouldn’t have had a recession. But markets didn’t clear, so appealing to some version of Says’ Law doesn’t make sense when the whole problem is that Say’s Law breaks down during a recession. BTW, the 2009 Obama fiscal stimulus package was way too small. It only amounted to about $710B in new stimulus spread out over three years, with about half of it going to inefficient tax cuts. It should have been closer to $1.5T, which is much closer to what Obama’s economic team thought the number should have been. I have never read so much blah, blah, blah from you but I will try to read what you wrote and respond. Question 1: Unlike you I choose to use my real name at this website. But what other personal information specific to me is mine to give or not. Since it seems to make you feel better, please be free to speculate all you want. Question 2: I was quite clear in what I wrote. Circumstances should dictate how much government should spend and on what. It may be true that deficit spending in general may be appropriate, but not in all cases. I give a current example. Venezuela could cut all deficit spending. All that would happen is those who gain by corruption, are bribed to follow the army, and Swiss bankers would have less trouble trying to find hard currency for the patrons. That is a place that no spending and even no federal taxation would result in a quicker and better recovery. And by the way, your spending multiplier being bigger than tax cut rate multiplier is bs, measurement of such is much too tenuous. Sorry, slug, that’s all, Tonight, I just don’t have the patients to deal with Keynesian Dogma. It has gained acceptance far beyond its worth. And that acceptance is only because it supports big government in general and socialist ideas specifically. What are Republicans paid to do? Does their pay increase with either GDP or smaller deficits? Lord – this “rebuttal” is even weaker than the comment from CoRev. Trump’s tweets make even more sense than the two of you. Ed Hanson, I am happy to finally see a Republican admit that it was the policies enacted by the Republican Congress that was responsible for the weak recovery under Obama. I’ve argued that for years But I guess I will have to live with Trump misdiagnosing the disease and consequently offering polices that will just make the problem worse. I said over a year ago that it would be very easy for Trump to achieve 3% real GDP growth. All he has to do is let the federal government grow. By the time the republicans could control the excessive spending, the slack recovery was already years too long. I know you are probably incapable of looking at the President Reagan recovery with clear vision, but that is an example of much better government policy bringing a vigorous recovery. So don’t bother with ‘it was the repubs fault’ line; history and time line shows the design of the recovery policy was completely the dems and President Obama. And any kudos are strictly lipstick on a pig. Their policy failed. Reagan? How ignorant are you? His economic mismanagement led to a massive recession which we eventually recovered from. As far as spending, the ratio of Federal spending to GDP did not decline an inch. You have no clue about economics and less about our history. sorry it was Paul oVlker who gave you that recession. Reagan ( and Volker produced the recovery and then some with a significant fiscal stimulus when deficits din’t matter. It is pertinent to note Republicans wanted to be rid of Volker who thought 4% inflation was okay and Volker did not. Do not blame Reagan for the wrong problem. Spencer, I predicted in early 2009, Obama’s stimulus policies wouldn’t work well, except they ended up worse than I expected. Robert Barro more correctly predicted Obama’s policies. Barro? LOL! Barro worried about inflation from too much money. And if you said the fiscal stimulus was too low – no one else saw your bold prediction. Now Krugman wrote this piece. Please tell me that you are not Paul Krugman spoofing this blog for good chuckles! President Trump’s pro-business policies will not make the economy worse. Whereas, the anti-business attitude of the Obama administration did inhibit growth. Growth has thus risen from the Obama-era 2% to a new 3% plateau until such time that the debt burden — the economy’s main impediment other than the corruption that infests all branches of government and the corporate world especially high tech and banking — strangles growth. That crunch is about two years ahead, when the growth effect of fiscal stimulus begins to wane. Draining the swamp should be and is the number one priority of any occupant of the White House. No economy can perform optimally or be better than the socio-cultural roadbed on which it resides. In my inbox this morning: John Kemp on Jim Hamilton and oil prices, July 2014. I stepped up to support Jim, and both of us were wrong, specifically because we — like many others — did not believe shale could produce so much, so fast. Interestingly, Kemp has now started to trot out these old articles again, with oil prices rising and the futures curve in steep backwardation. Low oil prices will last as long as the shale boom. At present, US shale is up 1.6 mbpd (incl ngls) over last year, which constitutes materially all of global production growth — and even so, the market is short. When shales lose their resilience, we will return to the world of 2011 – H1 2014 in a matter of months. Steven, IIRC you guys predicted a shale break even price that we have exceeded. For shale natural gas, that source/market is just being explored. The next decade should be interesting, esp[ecially if we string together several more colder or longer than usual Winters. The shale breakeven price for oil, in most plays, seems to be in the mid-$40s. Therefore, incremental wells should be accretive. I expect shale financials to come in better than expected, yes. I haven’t really looked at shale gas in a while. In essence, US shale gas is primarily serving the domestic market. US shale oil production is providing 50-100% of global supply growth for oil. And the Permian is most of that. Cana Woodford (Scoop / Stack) is under-performing expectations. Rig counts in the Niobrara look bad. So, a lot of pressure on the Permian. It can’t meet global demand growth needs forever. And let us guess what happens now that Ford and GM (soon to follow) are basically getting out of the car business and putting all their eggs in the light truck/crossover SUV market. Gas prices go to $4/gal and dealer lots are flooded with white elephants. I don’t blame Detroit entirely; after all, Detroit is just responding to the immediate gratification impulses of myopic American consumers. We’ve seen this movie before. And Trump will predictably call for voluntary export restraints and tariffs on economy imports. They made the same mistake back in the 1970’s. And the decline in US car production is now history. The Japanese automakers will eat our lunch with their new designs all assembled in China! That was my reflex as well. Oh boy, if Ford is focusing on SUVs, then count on oil shock right around the corner. While it is true that “specifically because we — like many others — did not believe shale could produce so much, so fast. Interestingly”, it was not where and why you and Professor Hamilton went wrong. Wrong being to strong a word, because Professor Hamilton’s study and analysis brought many valuable incites to workings of the oil and gas industry (I do not mention you in this last sentence only because I did not read much of your product and coould form no opinion). The mistake is actually simple. It was underestimation of the two most powerful elements of economy. One, the individual capital of human mind, thought, and innovation. Two, the power of price to bring the scarce into useful quantity. The underestimating I write of is not unique, but a common problem. As far as I know, it has never been and probably cannot be quantified by equation, calculation, or econometric. But it is real and will always be powerful. Well, Ed, the cornucopians were right, so perhaps innovation and imagination will always find a solution. On the other hand, it took nine years, from 2005 to 2014, to really move the needle on the oil supply. And the supply, at the end of the day, was moved by Americans. As a practical matter, we haven’t found any more oil in the last few years, at least the conventional stuff. So, I think we go right back to high oil prices when US shales can no longer keep up. But maybe not. Innovation is hard to predict. That is certainly for sure. Nine years? It is funny how different perspectives can be. I would say nine years is miraculously fast. I am quite an optimistic person at times, Steven, but innovation, imagination and just plain hard work will always find a solution. BUT. only when allowed. It is the crime of modern society that it allows (and wants} government to stop such human capital. Steven, “Innovation is hard to predict. That is certainly for sure.” I’m older than the average commenter here, and remember all the threats of peaks for the various raw resources and even food starting in the early 50s. None of them have happened. They never were talking about running out of anything, but running out of something at today’s cost to produce. As you said: “As a practical matter, we haven’t found any more oil in the last few years, at least the conventional stuff.“, but we have found much unconventional stuff which cost more to produce. Since this is an economics blog, economies adjust to these higher production costs naturally, and they continue growing as mankind’s conditions improve with them. What is consistent is the error of the long term predictions even while the short term perturbations get absorbed. The last major world-wide perturbation in economic progress was the Great Depression followed by WWII. Both were caused by mankind and affecting a generation. Major natural perturbations are cyclical climatologically and called glaciations. You should provide a link to and thread discussing your discussion with David Beckworth – it was an enjoyable listen during my commute this a.m.
Look – I’m the one who argued we had insufficient regulation in the financial sector and now PeakyBoo finally gets this blaming I guess the Democrats and not his team as in Phil Gramm. OK! So what is his solution? Doing nothing apparently. Like I said – he needs better material than he gets from Fox and Friends. Michael Bloomberg is an American businessman and politician who was Mayor of New York City. With a net worth of $45 billion. He is the founder of Bloomberg L.P., a financial data-services firm. Fannie and Freddie did not cause the financial melt down. Yes there are a lot of right wing trolls who claim that. All of them are either really ignorant of the facts or serial liars. In your case – I would argue both! The solution is eliminating excess regulations. So you think that less precisely worded legislation and implementing regulations will result in less litigation??? Really? Sheesh. You should spend a little time in the real world. Your comment is especially amusing in light of your sensitivity to securing intellectual property rights. Apparently it never occurred to you that secure IP rights depend on highly complex regulations and laws. If you’re genuinely worried about regulations that strangle economic growth, then I would suggest you take a good hard look at GOP dominated state governments. It’s a veritable Lobbyists ‘R Us seventh heaven. Peak only gave the number of pages in the legislation. The Obama administrations were still writing regulations at the end of the second term. Yes, the whole complicated mess is a litigation disaster. But more so, the poorly designed intrusion in the banking industry has greatly benefitted the very biggest banks. But that is what should be expected from big government – big cronyism. Ed Hanson the poorly designed intrusion in the banking industry has greatly benefitted the very biggest banks. Ah. I see. So that would explain why the biggest banks are so strongly against Dodd-Frank…because it benefits them. And I guess that would explain why the biggest banks have been working on ways to bring them under the TBTF threshold. Would you like to buy a bridge in Alaska? I suggested that Ed publish his definition of “excess spending” in the AER. You could write another piece for the AER giving a specific definition of “excess regulations”. I’m sure the editors are eager to publish both pieces!